Super flavorful chicken, marinaded in a lemon grass and ginger marinade overnight. I love the fresh, bright flavors of Vietnamese cooking, the way well seasoned, savory – and sometimes spicy – meats are paired with crunchy veggies. 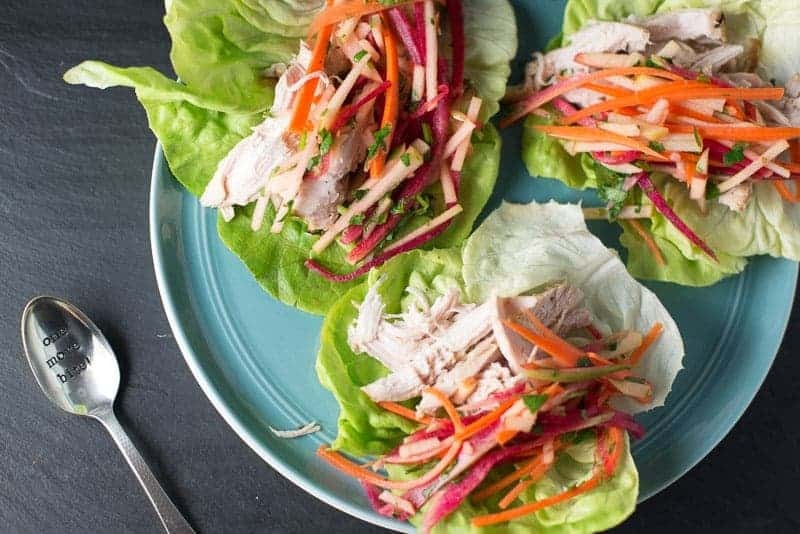 This lemongrass chicken lettuce wrap topped with a crunchy carrot and apple salad brings all of these fresh, bright flavors together in an easy-to-make and even easier-to-eat meal. Crunchy, tangy, savory and delicious! During the week I am usually super busy. Having a full time job and a family sometimes doesn’t leave a lot of leisure time at the end of the day and I don’t always have time to cook the kind of healthy meals that I want to. Because I know this I do a lot of food prep on the weekend so that I have things waiting for me in the fridge that I can either heat up or throw together on the fly. I have a few go-tos that make my life easier. One of these is lettuce wraps – it is like the taco theme just keeps on showing up! The lemongrass marinade is versatile, and can be used on either chicken or a lean cut of pork. It is really flavorful, and I use it often when I am doing batch cooking – it is easy to marinade a big batch of chicken so that you can cook it up and then keep it in the fridge. With pre-prepped ingredients waiting for you at home it is super easy to throw together this lettuce wrap, a quick salad, or even on to a rice bowl.
. I have tried more expensive mandolins but this one really is the best. If you use it a lot you might have to replace it as the blade dulls, my last one lasted for about 2 years. Most of us start out with our grand New Year’s Resolutions and for 2 weeks (or maybe just 2 days) we are all in!!! And then BAM we are back to our old habits all over again. This year I am resolving to take things slower, make smaller goals and celebrate tiny accomplishments. Sounds defeatist? Not at all. Research has shown that when we take on too much we fail more often. There is something to be said for making one small change at a time, and really celebrating when you are able to do just a little bit better than you did yesterday. Having this mindset allows us to be nicer to ourselves. Self improvement is about assessing where you are, figuring out where you want to go, and then moving there steadily and slowly with unwavering focus. When we take on too much we often fall victim to the “all or nothing” mindset. We set a really high standard for ourselves and then when we fail to meet it perfectly we give up everything. When you want to get stronger it is important to figure out where your starting point is – how much can you deadlift today? You are not going to run down to the gym and pick up a 300 lb barbell if you have never even picked up a barbell in the first place. You figure out that you can deadlift 150 lbs, and then you add a little bit of weight each week until you can eventually pick up that 300 lb barbell – No Problem!! We can apply this practice to all of our goals in life. Why would we expect ourselves to hit January 1 and then all of a sudden have the skill set to eat perfectly clean 100% of the time, or have a flawless exercise plan in place when last year’s fitness plan involved watching sports on television? Life often gets in the way of perfection. Moving away from old habits and acquiring new habits is like heavy lifting where we add a little bit at a time, we get used to the new load and then it gets easy. After it is easy, we add a little more. Let’s try to go a little slower this year, and be a lot more successful at reaching our goals than we were last year. This marinade is great for chicken and also works with a lean cut of pork. Marinade overnight, bake or grill, and then have an easy and delicious protein all week. Add all ingredients to a large freezer bag or a non reactive bowl. Baking: preheat oven to 425 ℉, bake for about 20 minutes. Internal temp should be 165 ℉. Grilling: Sear meat and then move to indirect flame cook until internal temp is 165 ℉. Pan cook: Thin sliced pork can be pan cooked until browned on both sides. Cook on medium to medium high heat. Don't over cook or it will be dry. Grilling: Grill over high flame. Sear meat. Thin sliced pork with cook very quickly on the grill. Excellent with lettuce cups and carrot-apple slaw. Crisp and refreshing, this salad make the perfect addition to a lettuce wrap. Peel and julienne all vegetable and chop cilantro. Add to a bowl and toss with remaining ingredients.